The Workbench Diary: Some Local Press!? 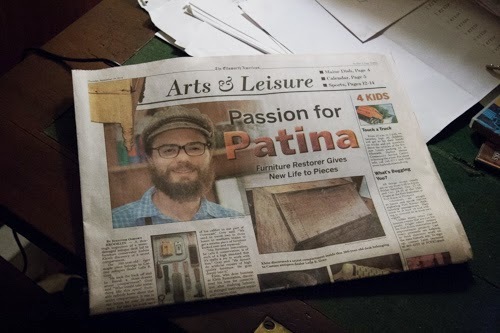 Last month, The Ellsworth American did a story on me and my work in their Arts and Leisure section. I had no idea the size of the story they were going to write. I thought maybe if I was lucky they'd even put a small picture of me in the paper! Wouldn't that be something? Well, when I opened the paper that day this is what I saw: my big mug shot! That was surprising. They used a handful of interesting pictures from my blog and wrote up a nice piece. I feel like they did a good job capturing the essence of what I was saying. They wanted to talk about two different aspects of my work. They first talked about my conservation practice and explained the what and why kinds of questions. Then after that they wrote about my research into Jonathan Fisher. They even interviewed a few local antique dealers to get their opinions of my work. All in all I was pretty flattered by the way the article came out. Thank you Jennifer Osborn! Congratulations on such a well written article. Thanks. You have a great Sunday as well, Jonas! Excellent article which nicely reflects your business, ethics and practice. I have followed your blog since the beginning and have been delighted with the growth in you life and the fulfillment you show. Please keep blogging; if I don't learn something (seldom) I am always inspired. ps: I also used one of your blog entries to try to convince my wife we needed a wood fired oven in the back yard, and of how simple they can be to build. No success yet. Thank you so much for the encouragement, Scott. I have found this blog to be a great discipline for my professional development. I've found whenever I have to explain a topic back to someone, my own understanding grows tremendously. Good luck on the oven. Get Kiko Denzer's book and show your wife all the beautiful ovens! Congratulations! A reputation like that can be earned, but can't be purchased.